About two years ago I posted my Low Country Boil recipe. Since then, this recipe has become a family favorite. As soon as we can get our hands on some fresh corn, we make a big pot of this dish. It's a great summer alternative to barbecue when you don't want to turn on the grill (or if you don't have a grill). It can serve at least 4-6 people and can easily be doubled if you have a big pot. Plus, it's easy. 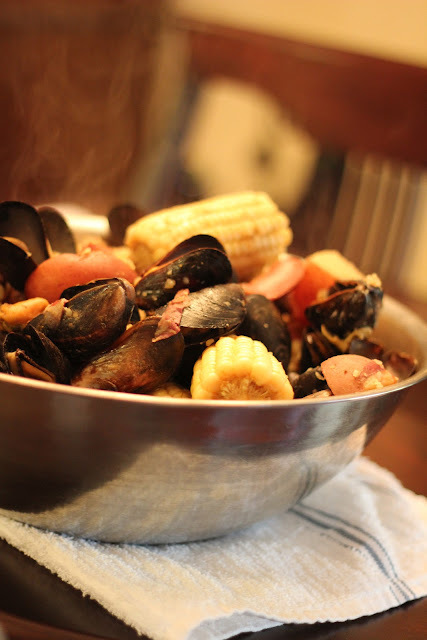 This Memorial Day weekend we decided to try this recipe with the addition of mussels. We followed the original recipe, but instead of adding all shrimp we included one pound of shrimp and three pounds of mussels. This was our first time cooking mussels at home and it was easy. Don't be intimidated by mussels, there are some great tutorials available on how to clean mussels and check to be sure they are safe to cook and eat. The juice that forms at the bottom of the pot is very savory and a little spicy. I love rolling my corn in this flavorful juice. I also used a spoon to pour the juice over the cooked mussels in my bowl and I even sopped up a little with a cheddar garlic biscuit (recipe coming soon). If you live in an area where you can get your hands on some fresh corn and some fresh seafood, give this recipe a try! Here's the link to my original recipe. *Special thanks to my mom who prepared this recipe last weekend. Growing this cute little baby has left me exhausted and my mom has been stepping up and remixing all kinds of recipes from My Life on a Plate. She's spoiling me royally! With just 11 weeks left until my due date and the temperatures getting warmer around here, I really appreciate any help I can get! Looks delish! Enjoy all the extra attention because when the baby arrives, I'm sure grandma is going to spoil him to pieces! As always, this looks delish! I've never actually had low country boil, but I'm dying to try it. Love this!! It looks so good. I'm going to check out the original post and recipe for sure.